Every time I look on eBay, there is a new and previously unknown to me Chinese fountain pen manufacturer. Despite my past disappointments with the cheap Jinhao pens - heavy, poorly weighted and with broader nibs than I can appreciate, I have had recent success with newly discovered brands. The Wing Sung 698 is a beautiful TWSBI-esque fountain pen, and I still enjoy my eye-droppered Lecai. Both are part of my daily carry. At the January meeting of the Vancouver Pen Club, one of the members had a pen from PenBBS. This was a pretty blue colour, and it wrote very well. Shortly after the meeting, I was on eBay checking out the product line. I found an attractive multi-coloured acrylic pen listed with a fine nib. It was expensive for a Chinese made pen - about USD 30 plus shipping, but I took a chance and ordered it. To my surprise, it arrived in less than two weeks, and the pen was even more beautiful in person than I had expected. 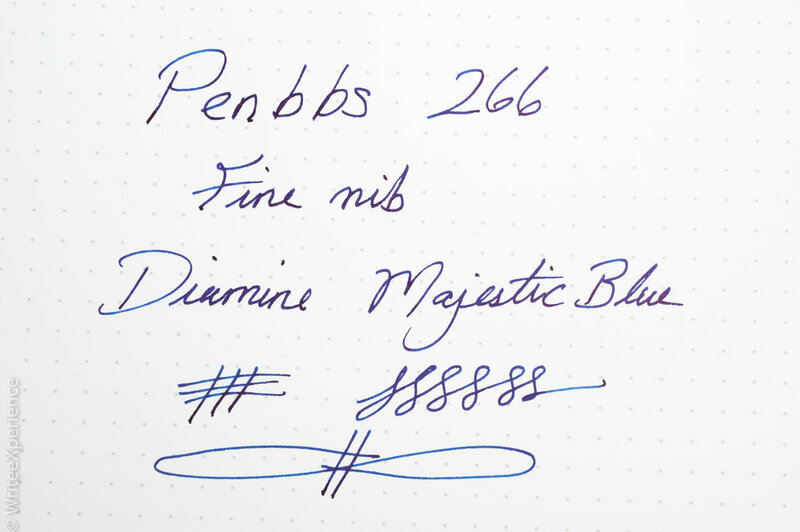 The PenBBS fountain pen I ordered was the model 266. It is a stunning blue and green semi-transparent acrylic body. In person, the colours are stunning with the blue and green fading to a transparent white through the transition. Rather than being a smooth swirl, the acrylic has a cracked ice appearance, with an almost crystalline structure. It is one of the prettiest pens I own and well worth the price as an art piece only. The trim is silver coloured and simple. The pen comes with an unmarked clip and band at the top of the cap. This is complemented by a single thick cap band. The cap band is engraved with penbbs and the number 266 in English. The maker's logo - a P bracketed in what appears to be the zodiac sign for cancer - also appears on the cap band. The silver steel nib in this pen is fine tipped. It appears to be a # 6 Nib and is decoratively stamped with "PENBBS," "since 2005" and a decorative swirl surrounding the text. A cursive "F" denotes the size and "China" are also stamped on the nib. The feed is black and finely finned. I find it to be quite thick, unlike the more common Chinese feeds I have come across, but it does seem to hold a lot of ink and does an adequate job of feeding the nib. The pen came equipped with a converter, which is of a standard design and functional. 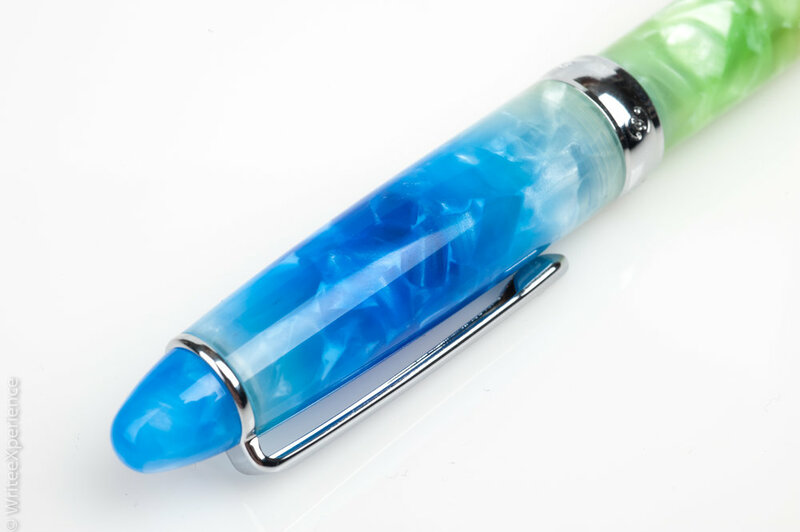 The body of the pen is a solid piece of Acrylic. This pen may be ideal for those that like to eye-dropper their pens. I noted that the threads connecting the body already contain a small o-ring, which may indicate that this pen would be good for eye-dropper, but not something I tried myself and recommend testing with water before putting ink in case of leaks. I have been fortunate lately with perfect nibs out of the box, especially on the several interesting Chinese pens I have purchased. The nib on this pen was good - but not great. It was quite smooth but tended to dry out very quickly and exhibited some hard starting. Occasionally, it would skip while writing a letter. I made a couple of very small adjustments to the nib to make a great writer. Under a loupe, I could see that the slit in the nib was not perfectly straight. It slightly veered to the right by a few degrees and also the slit was very tight. I could not even fit a small Goulet brass shim into the nib. I used a thumbnail to push each tine upwards slightly in turn, away from the feed. This slight bending was enough to allow my shim to fit into the ink slit. I then checked the alignment of the tines at the tip, holding the nib upside down at a 45-degree angle (similar to that angle that it would contact a page with). I was lucky, and the nibs were still nicely aligned. I ran the tipping of the nib on some 4000 grit micro mesh and then finished it off with a 12000 grit treatment and now have a nice, wet writing nib. It was good before, but with some easy work, the nib performance is worthy of the beautiful pen body. This pen really is stunning. It has been my daily writer since it arrived a couple of weeks ago. I filled it with Diamine Majestic Blue and, with the slight adjustment to the nib mentioned above, find this to be a beautiful pen. Based on my small sample size of the pen sampled at the club meeting and this example, I can recommend the PenBBS pens. Especially if you do like pretty and somewhat extravagant looking acrylic pens.